Wellness isn’t our go-to thought this time of year. Often, we set aside mind and body wellness as we grab another Christmas cookie or struggle to remember those last-minute gifts. Don’t let this happen! Last week we discussed cherishing the gift of a healthy memory. This week let’s honor the gift of wellness. Most people describe wellness as being healthy or the absence of illness or disease. An ideal blood pressure or not getting sick when others do is a plus. But these aren’t wellness. They are indicators of our wellness. Wellness is our ability to adapt to changes occurring inside and outside of our bodies. Memory wellness is our ability to maintain a functioning memory regardless of circumstance. Looking at wellness with this perspective, things begin to shift. It’s not the perfect blood pressure at the doctor’s office, but a healthy blood pressure on a stressful day. It’s not the absence of disease but how we can manage and live with or through a disease. Much of this is driven by our choices, behaviors, and habits. My goal with MemoryMinders is to help anyone to a well-functioning memory-whatever that looks like. If you have no memory issues, we can offer suggestions to help you sustain or even enhance your memory abilities. If you are living with the beginning stages of a memory-related illness, we can help you maintain the function you have or perhaps slow the decline. But none of this happens if we don’t choose to honor the gift of wellness in body and mind. It all comes down to choices. Both the choice to honor wellness in the first place and our daily wellness choices are equally important. No one makes these choices for us. Each of us decides what is needed for our own wellness. Every day is different and we must adapt. If we don’t, we may find ourselves sliding on a slippery slope away from wellness. Earlier this fall, I did a series on holiday habits on my other blog. Thinking about our habits ahead of time often makes choices easier when wellness stealing situations arise. 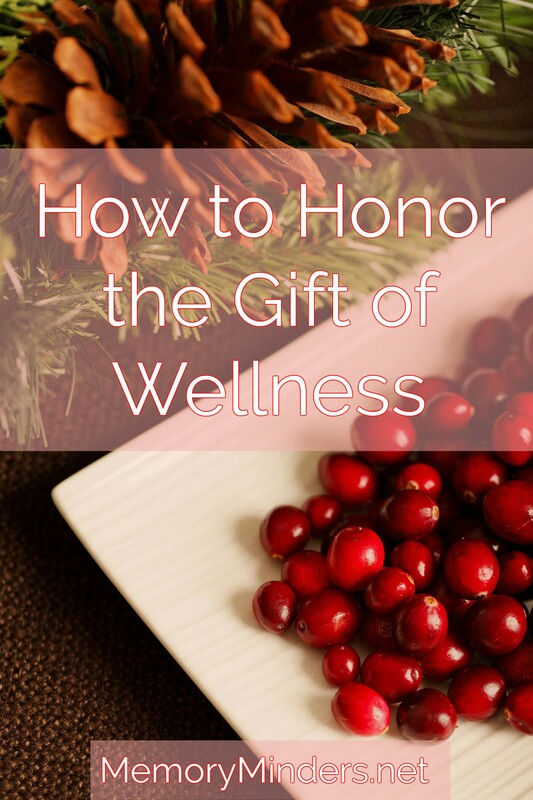 See if any of the tips regarding holiday wellness can help you these next few weeks. I wish you all a memorable and well Christmas and holiday season! P.S.-If you’re still looking for the perfect gift for a loved one or yourself, give a subscription to our Academy! It’s full of mental fitness exercises, tips, additional research, and strategies. See details here. Take advantage of our holiday sale-but only through this week!